These are the nail polishes you lust over looking at them in magazines. A little too expensive, but so unique, there’re forever on your mental wishlist. Because it’s on the expensive side, I would suggest to anyone wanting to start their collection, to purchase the more unique glitters instead of the regular creme finishes. The creme colors are of course beautiful, but if you’re on a budget, spending $18-20 on a nail polish isn’t reasonable. I only bought one of my DL polishes at full price, and that was the only item I purchased at the store cause I felt so guilty for spending so much on a polish! But Across the Universe had been on my wish list for so long…. teal, glitter and a Beatles song. It’s like it was made for me! I would suggest waiting for a sale on a flash sale site such as HauteLook, which is what I did. I paid $7 for the full size polishes and $9 for the set of two minis with a little glitter bag. Deborah Lippmann’s own website will have sales, so I would keep an eye out for those emails! Just because it’s higher end doesn’t mean it’s going to be easier to deal with. Glitter is glitter! It’s a glitter nail polish so of course it’s difficult to remove, and it also chips fast. It’s just the nature of glitter. But the upside to glitter polish is that it dries fast. Also with Deborah Lippmann polishes, they usually come with a transparent base color and all it takes are 2-3 coats for it to look completed. (I don’t want to say opaque cause the base is sheer, but it seems to be just enough color and glitter that you’re done.) Some other polish brands may take several coats to get the wall-to-wall glitter. 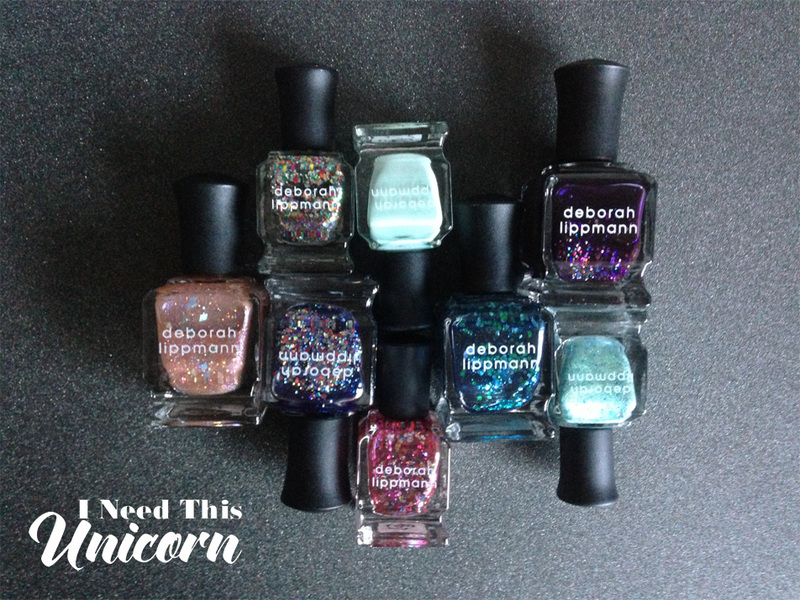 Deborah Lippmann is so generous with the glitter, it won’t need to take as long to do your nails. Two coats is usually fine, but for a color like Daydream Believer (the pink one), an additional coat might be preferred if you like a lot of glitter. The one creme color I have also only took two coats to be fully opaque. So far after four days of wear, I haven’t had any chipping, though I am also wearing two top coats, one being an anti-chip top coat! Top to bottom: Flowers in Her Hair, Mermaid’s Dream, Across The Universe, Stronger (created with Kelly Clarkson), Let’s Go Crazy, Daydream Believer, 99 Luftballons, and Happy Birthday. The top two have 2 coats, the glitter polishes have 3 coats and had a generous amount on the brush. I didn’t apply any top coat to the wheel swatches, but I would definitely recommend it when applying to actual nails. This post is not sponsored. Everything was either purchased by me at HauteLook or Skins 62, or came as a freebie with code with a purchase at Sephora. This post contains a referral link.